NASA's New Horizons Spacecraft was launched to give us the first close-up view of Pluto, and it's delivering. 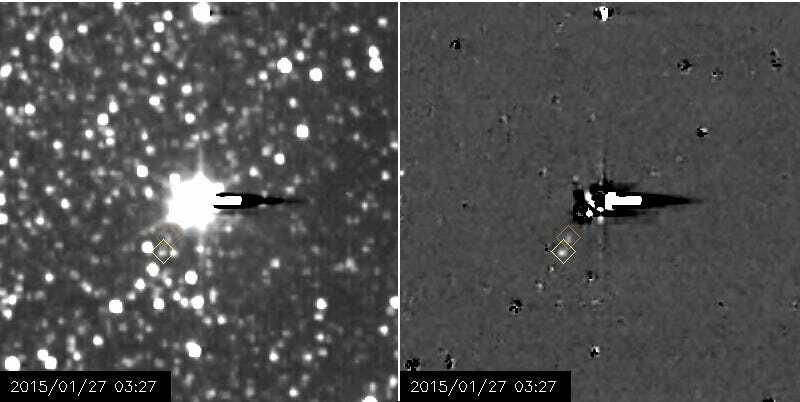 This footage shows the best-ever view of two of its tiny moons—one of which never been seen before. The two moons, Nix and Hydra, are visible in a series of images acquired by New Horizons between January 27th and February 8th. Those images are assembled into a seven-frame movie here, so you can see the moons orbit Pluto. Hydra sits in the yellow diamond, Nix in the orange. This is the first time Nix has ever been caught on film. The existence of Nix and Hydra was first identified, by the team that put New Horizons into space, within Hubble Space Telescope images back in 2005. Hydra orbits Pluto every 38 days at a distance of approximately 40,200 miles; Nix orbits every 25 days at a distance of 30,260 miles. The moons are small—-between 25 and 100 miles in diameter. We'll have a better idea of their size as New Horizons gets closer to them.